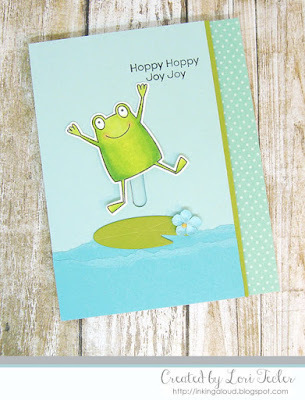 Here's my card for the current My Favorite Things Wednesday Sketch Challenge. I used the layout to show off one of the fun images from the Toad-ally Awesome stamp set in action. I stamped the bouncy fellow and colored him in with Copic markers, then used the coordinating die to cut out the colored image. To make a backdrop for the image, I adhered two dark aqua cardstock strips with torn edges to the bottom of a lighter aqua panel. So that the image would be able to "jump," I used the little slider die that came with the die set to cut a channel in the panel just above the torn strips. After adding the die cut lily pad to the panel, I positioned the image in the channel using one of MFT's Spin and Slide discs. I used foam tape to adhere the panel to a card base with a strip of coordinating dotted aqua patterned paper along the right edge of the cardfront. The foam tape raises the panel just enough that the image slides up and down easily. A tiny paper flower accent adhered to the lily pad completed the design.